Among the box pews of the perfect Georgian interior of the church at Langton by Spilsby in my previous post is a object that has existed for much longer than the church itself. 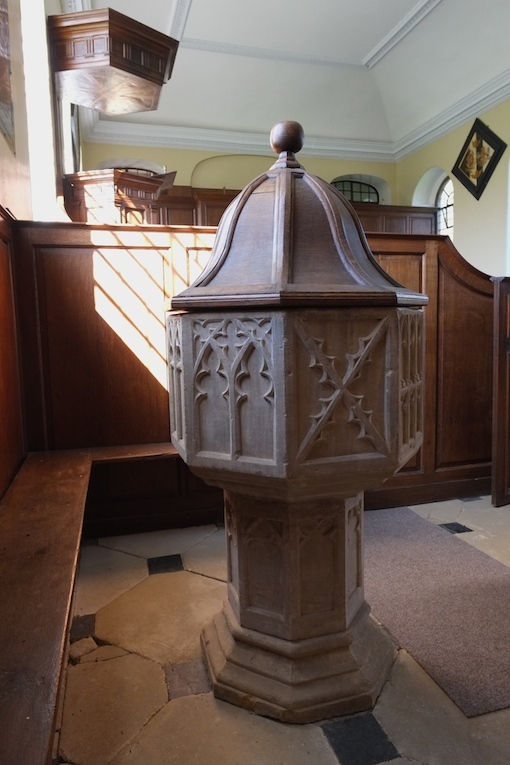 It’s the font, which must have been recycled from a medieval church, presumably on the same site, when the current building was put up in the early-18th century. This sometimes happened with fonts. As vessels of the sacrament of baptism they acquire a holiness of their own, which, combined with their aura of antiquity (generations have been Christened in that font), and sometimes their sheer beauty and craftsmanship, gives them a good chance of survival. This one is a ‘pattern book’ font on which each face illustrates a design of window tracery, and it is similar to a font in Warwickshire that I’ve posted about before. It’s late medieval and bears tracery designs that are mostly in what we now call the Decorated Gothic style of the 14th century. 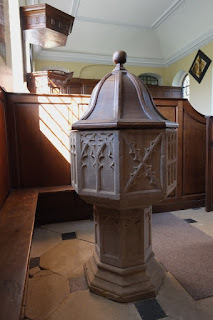 But there’s one face with a design of the Perpendicular style that spread across England in the late-14th and 15th centuries, indicating that the font must be late-14th century at least. My photograph shows a couple of particularly crisp Decorated tracery designs. Although out of place chronologically, the font sits beautifully among Langton’s box pews and under its curvaceous, dome-like cover, presumably a contribution of the woodworkers who fitted out the church in the Georgian period. Across the lane from the picturesque cottage in my previous post is the church of St Peter and St Paul, Langton by Spilsby, a brick building in a severe classical style dating probably to the 1720s. For me, the main interest of this building is its unspoilt Georgian interior. It’s beautifully fitted out with panelled box pews, three-decker pulpit , and wooden panelling behind the altar. At the west end there’s also a wooden gallery supported on fluted columns, one of which is just visible in the left foreground of my photograph. This is the kind of interior that church-crawlers mean when they talk about a ‘preaching box’ – a church, that is, specifically designed for Protestant worship in which the important thing is that the congregation is able to sit and listen to the sermon. So there’s nothing much in the way of statuary or painting, the pulpit dominates the space rather than the altar, and the shoe-box shape of the building makes for good acoustics. Clear glass in the windows provides light enough for reading one’s Bible or hymn book and in this particular church the natural light can be supplemented with a generous number of candles – there are candle-holders everywhere. The pews are arranged facing inwards towards the central aisle. This is quite an unusual arrangement for a parish church (it’s more common in the chapels of Oxbridge colleges) and takes the focus away from the altar. It also makes it hard for those on the right to look at the preacher, but I suppose the important thing is to listen, not to look. Whatever the practicalities, it makes for a pleasing, symmetrical layout. Whoever the carpenter was, he must have been pleased with the job. The curving panelling around the tiny apse, mirrored by the pews at the far end, are particularly satisfying. Perhaps one of the occupants of those commodious east-end curving-fronted pews was Bennet Langton, writer and close friend of Dr Johnson, who was born in the great house nearby. One of the hatchments (the lozenge-shaped panels bearing funerary coats of arms) on the church wall is his. But the small quiet country church of Langton by Spilsby, for all the sophistication of its furnishing, seems a world away from the busy literary world in which Johnson and his friend played a prominent part. What shape is a house? I checked the Pevsner Buildings of England volume on Lincolnshire before setting out to find the severe classical church of Langton by Spilsby, all red brick and box pews, but I didn’t notice the book’s two lines on this nearby cottage: ‘E of the church an eminently picturesque cottage orné,* circular, with a conical, thatched, overhanging roof.’ Fortunately this eye-catching product of the Picturesque movement was the first thing I did notice when I pulled up by the church. 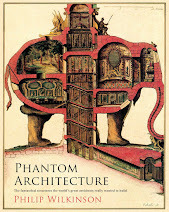 Pevsner gets it right, more or less. He might have mentioned the mud and stud construction, the Gothic pointed windows, the elaborate pattern of the glazing bars (a mix of elongated octagons and lozenges), and the fact that the roof overhang is supported by slender columns, but we get the idea. There’s an odd thing though. 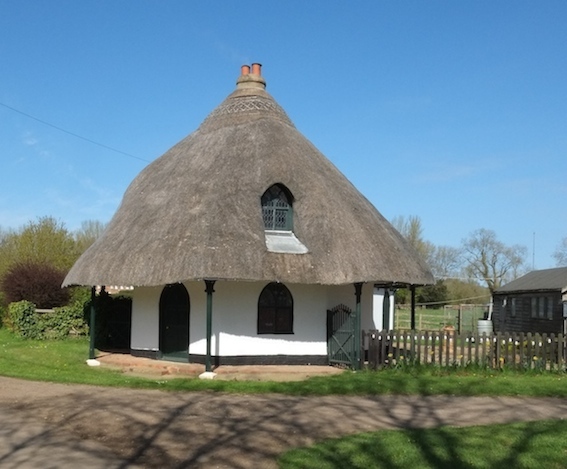 Would you call this cottage circular? Its footprint seems to me octagonal, with fairly crisp corners to the wall and a column at each corner. The thatched roof smooths out the shape, as thatched roofs do, but still has more or less obvious facets. By the time your eye reaches the top of the roof, you’re gazing at an elliptical chimney pot. So: Circular? Octagonal? Metamorphic, perhaps. There have been at least three big houses at Langton – an old hall, a rebuild of 1822 that didn’t work out because of bad foundations and was demolished, and a third, a Victorian hall, that has also been pulled down. This small but striking cottage, perhaps built in the early-19th century to please the owner of the estate and house servants or farm workers, has outlived them all, a survivor in a quiet lane by the church and the ubiquitous Lincolnshire farms. * Cottage orné Rustic house of picturesque design, as the English Heritage definition has it. 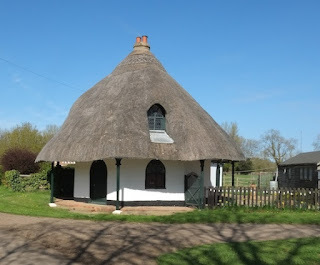 Cottages ornés were built in the 18th and 19th centuries and have features such as polygonal plans, thatched roofs, pointed or quatrefoil windows, and ornate or rustic woodwork. Tucked away down a narrow lane amid lush evergreens and folded into a bend in the River Wye north of Ross is Brockhampton, home of a beautiful Arts and Crafts church that has repaid several visits and yielded a post on this blog some years ago. Opposite the church is the drive to the big house, Brockhampton Court, rebuilt in 1893 by George F Armitage in Tudoresque style. The big house can’t be seen from the road, but the North Lodge at the gate is a small landmark, a dazzling bit of Tudoresque timber work. With its array of black wooden quatrefoils, lancets, struts, braces, and jetties, this lodge looks more Cheshire than Herefordshire and the overhanging roofs and porch look as if they derive as much from the cottage orné tradition (deliberately picturesque cottages dating mostly the from the early-19th century) as from any close imitation of Tudor building. What a dazzler, though: a noisy little building metaphorically sounding its trumpet at the distant gate. And what a gate, all curly ironwork going this way and that. It’s a piece of work more in keeping with the Arts and Crafts church opposite and maybe is by one of the craftsmen who worked there. I don’t know who designed the gate but the lodge is by Barry Parker, who worked as Armitage’s clerk of works and stayed on to do this extra job. Parker was one of the team (Parker and Unwin) who planned the first garden city (Letchworth) and the exemplary garden suburb (Hampstead Garden Suburb). The year of the Brockhampton lodge, 1902, was the year before Parker and Unwin submitted their plan for Letchworth. The tree-lined roads and vernacular-inspired architecture of the garden cities have many antecedents; perhaps the leafy lanes of this remote spot of rural Herefordshire contributed its share of influence. This month’s illustration is by Barbara Jones (1912–78), one of my favourite illustrators, whom I like for her eclectic interests, her love of the byways of architecture, and her lively line. But she was much more than an engaging illustrator: she crammed a lot into her life. After school in Croydon she went to Croydon Art School and then the Royal College (first in the Engraving department then in Mural Decoration, which she preferred). She graduated in 1937 and began work as both a mural painter and a commercial artist when the war came. She contributed paintings to the wartime Recording Britain project (subjects ranging from fairground horses to the Euston Arch), worked as both an author and illustrator (Watercolour Painting, The Unsophisticated Arts), put together the exhibition ‘Black Eyes & Lemonade’ at the Whitechapel Art Gallery as part of the Festival of Britain, and pursued a tireless interest in eccentric and unusual architecture, resulting in her fat book Follies and Grottoes. And this is just a selection: her working life seems to have been a beguiling combination of interesting jobs, from more Festival of Britain Work, to designing exhibitions, pageants, and book jackets, and embracing interests that ranged from the decoration of canal boats to the design of tombstones. Popular or vernacular art – barge-painting, signwriting, fairground ride-making, the art of advertising, the creation of seaside amusements, etc, etc – was always close to her heart. 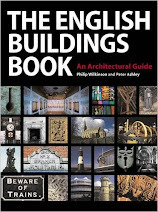 One book series including work by Barbara Jones is Visions of England, edited by Clough and Amabel Williams-Ellis. Her illustrations for the volume on Dorset include this stunner of a shop front, which illustrates her art and her enthusiasms rather well. The frontage has a kind of exuberance that I associate with the work of the woman who drew it. Dr Roberts, pharmacist and manufacturer of patent medicines, set up in business in Bridport in 1788. By the early-19th century he had commissioned this outstanding shopfront, which unleashes the whole architectural works – double bow windows with Gothic and other patterned glazing bars; a fascia above the ground-floor widows that features a band of Gothic arches; double doors with more ornate glazing. The whole is topped with a very fancy pediment, plus scrolls. Barbara Jones clearly relished all the fancy details, as well as the abundance of lettering, not just on the panels bearing the business name, but also on the sign between the windows, with its central curve: more scrolls. Such details are close to the popular art that Jones loved. Those exaggeratedly large scrolls at the top and the rows of star-like finials along the upper edges of the windows are kindred in spirit to the carvings on carousels or ships’ figureheads that feature in some of her books. The combination of swagger, bold gestures, and the common touch: that’s what she liked. I’ve included a couple of other examples from the Dorset volume. The sign for the Hambro Arms, Milton Abbas, displays the lively lettering that the Victorians and Edwardians often used for publicity, whether printed or sign written. It’s set in the context of a lot of curvaceous ironwork that holds up a lamp and the canopy over the door. Yes, yet more scrolls to delight the eye and to give Jones the chance to show off her way with an expressive line and a pen stroke of varying thickness. The gateway at Mapperton is slightly different, closer to the tradition of polite design. But it’s no surprise that similar curves – shell-topped niches in the stone piers, barley-sugar twisted uprights in the wooden gate, and those lead eagles (enlarge them and they could do double duty on a carousel) – have caught her eye and been caught by her pen. Look up. People are always telling me to do it. I am always telling people to do it. Look up above the tree line, at church towers, above the doors of houses, above shop windows. You often see something unexpected and rewarding. So when a splash of colour caught my eye above the modern shops of North Street in Sudbury I looked up and saw this: a bit of 1870s Arts and Crafts design that can still take your breath away about 140 years after it was built. I’ve called it Arts and Crafts because it demonstrates so many crafts in such a small space: colourful floral mosaic, incised plasterwork, stained glass, ornate metalwork (those floral finials that tops the little hipped roofs of the oriels), and the use of neat openwork ridge tiles. All of this is set within a strong design, with the Tudoresque timber framing, the pair of tall, narrow oriels (topped and tailed with hipped roofs and plastered undersides), and the russet roof. It’s an impressive piece of work and in a different league from the upper fronts of so many shops, where you find a bit of brick wall and a couple of sash windows if you’re lucky. I don’t know who commissioned this facade or what business was first housed beneath these mosaic flowers and Tudorish windows, but it’s good to see such care being lavished on so small a frontage back in 1876. Although the Arts and Crafts movement is often said to have got into full swing in the 1880s, William Morris’s firm was in full swing by the 1860s, and Morris and his colleagues founded the Society for the Protection of Ancient Buildings in 1877. 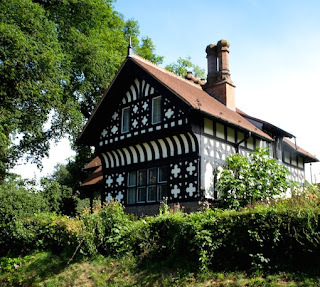 Morris’s work, the interest in design fostered by the embryonic Victoria and Albert Museum, and, above all, the kind of ‘Free Tudor’ architecture of Norman Shaw (as in is famous 1860s house, Cragside), set the tone. So, if we’re surprised by the restrained richness of this facade, we should’t be surprised at the date, the curvaceous numerals of which are incorporated into the mosaic. This kind of design was in the air. I’ve gone on quite often about English market buildings, those welcoming structures that mark the centres of so many towns, their open arches generously offering shelter not just for stall holders but also for passers-by, shoppers catching their breath, or teenagers hanging out. I’ve dwelt on the intricate carving on medieval market crosses, on the clock turrets that top many of these buildings, and on grander examples that are not just markets but also magnificent town halls. 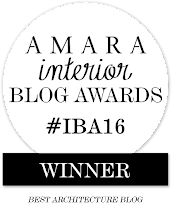 But, as regular readers will know, this blog is not just about architecture. What strikes me about buildings is very often the incidentals – odd bits of carving, the details of a window, fragments of old gilded decoration, and signs and lettering of all sorts. So here on the market cross in the middle of Shepton Mallet (a tall carved pinnacle originally of about 1500 surrounded by a stone hexagonal arched structure originally of about 1700, the whole rebuilt in 1841) it’s not only the architecture that caught my eye, but also these cast-iron signs. Signs like this were not about giving directions. 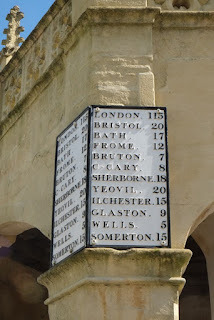 This one doesn’t tell you which way to go to get to Wells or Frome. It just tells you where you are in relation to the nearby towns. That in itself was useful to the traveller. When most people didn’t have a map, let alone a satnav, it helped to know whether your destination was, say 12 miles away (better to find a stable and a bed for the night and finish the journey in the morning) or 5 miles (in which case there might be enough time to press on). More than this, it places the town in its context, not far from the major centre of Bristol but over 100 miles from London; and it tells us that there are a surprising number of small towns within a few miles of this spot in Somerset. I find the spaced-out lettering, with even the full points spaced, charming. It’s also functional in that it enabled the sign-maker to accommodate nearly all the names. 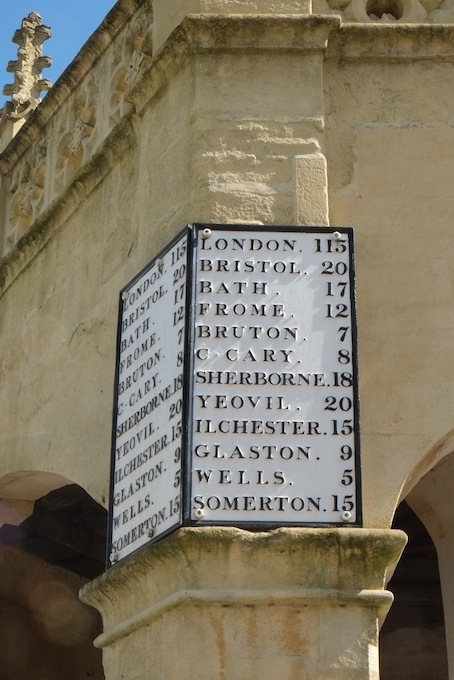 Long names like Sherborne and Ilchester fit the sign and only Castle Cary and Glastonbury have to be abbreviated. Modern travellers who are hurrying on to Bristol or Bruton are likely to miss all this, of course. Only the slow pedestrian has time to take in such things. And I’m rather glad that I did. Cheltenham has some fine restaurants, but few have interiors as striking as this one, set in a redundant church of the early-19th century. The church of St James, Suffolk Square, in Cheltenham, was built in the 1820s, originally to plans by local architect Edward Jenkins, designer of several of the surrounding streets of houses. But Jenkins hit problems – or at least his clients had difficulties with his plans. 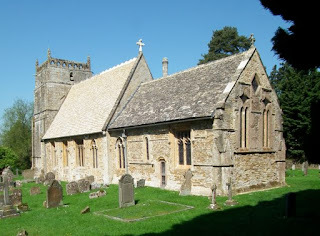 * He’d proposed a very ambitious roof, spanning both the nave and the aisles on either side, and misgivings were expressed about its structural strength, So an independent architectural enquiry was called, and the result was that another architect, Cheltenham stalwart J B Papworth, was brought in to finish the church. Papworth saw that the way to make the roof work was to build its supports out of iron. So those slender columns, apparently of stone, have hidden iron cores, and the dark-coloured arched trusses that sit on them and carry the roof are iron too, with Gothic detailing to distract us from their industrial origins. It’s an elegant and effective solution. In the nave, the architecture is not too fancy but carefully detailed – the stone that clads the slender iron columns is topped and tailed with very plain capitals and high bases. The columns support balconies halfway up that have fronts with Gothic tracery on them. But looking eastwards towards the big window, the carving gets much more lively. This is in part due to a makeover in 1876–82 when the church got a new east end. No doubt this was in response to architectural and religious fashion. Whereas the Georgian and Regency periods had gone for mostly rather plain box-like churches with good acoustics (ideal for listening to sermons), the later Victorian period saw a movement toward stressing the importance of the sacraments and providing a beautiful architectural setting for them. Carving, ornate arches, and a window with filigree tracery, were the order of the day. Now diners look towards the east end and watch priestly chefs demonstrate the craft of dough-kneading and the artful arrangement of toppings while the oven glows in splendour where the High Altar once stood. Sacrilege? Surely not. When a church falls redundant, it’s a happy day when someone finds a viable new use for the building. Against the odds, perhaps, St James’s makes a good place to enjoy a meal while contemplating the ways of architects, their engineering challenges, and the delicate Gothic architecture of the 19th century. I didn’t need much encouragement to stay for a very choclatey pudding, and I enjoyed it all the more for the surroundings. * Footnote Problems with Jenkins may have been exacerbated by the fact that around this time he eloped with Charlotte Balfour, the daughter of one of his patrons. By 1828 he had moved to Leamington, so perhaps he felt that discretion was the better part of valour and that his talents could be useful in a different spa town. St James's Church, Cheltenham is a branch of Zizzi. British banking expanded in the Victorian period, and it wasn’t just a matter of high finance. In the 18th and early-19th centuries there was a dearth of places where people on low incomes could save on a modest scale, putting away a small amount of money for hard times and unforeseen needs. Local savings banks were one answer, and such banks spread widely after the success of one founded by the Rev Henry Duncan in Ruthwell, Dumfriesshire, in 1810. It’s said that such a bank was started in Bury St Edmunds, Suffolk, in 1816. Thirty years later it was large and well enough established to move into these premises in Crown Street. 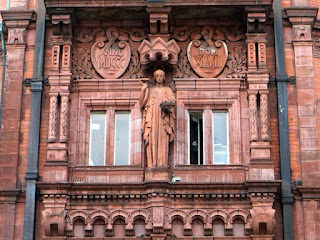 Lewis Cottingham, a Suffolk-born architect who established his office in London and became well known as a Gothic-revival specialist, was the designer of the bank. This commission came at the end of Cottingham’s life – he had developed a successful career as a repairer of churches and cathedrals (and was the restorer of the Norman gate tower next door to this site), and a builder of houses large and small. 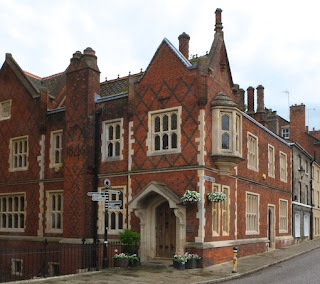 For the savings bank he chose neither straight Gothic, nor the classical style so often used for banks, but a red-brick ‘Tudor-Gothic’ style with stone mullioned windows, prominent gables, and tall, ornate chimneys. The brickwork has diaper patterns, which the Victorians sometimes used on their more decorative buildings, from humble cottages to William Butterfield’s vast Keble College, Oxford. The result is impressive, making good use of the corner site, but not grandiose. There’s a domestic feel to the building, and the look of the date, picked out in dark bricks, is more like something you’d see in homespun by a builder than on an architect-designed bank. So much so indeed that I took it at first glance to be a group of almshouses, in which the large door led to a courtyard. But a bank it was, and it served the people of Bury in this way until 1892. I’m told the building is now divided into apartments, and must also serve its residents well with light, attractive, and central accommodation. 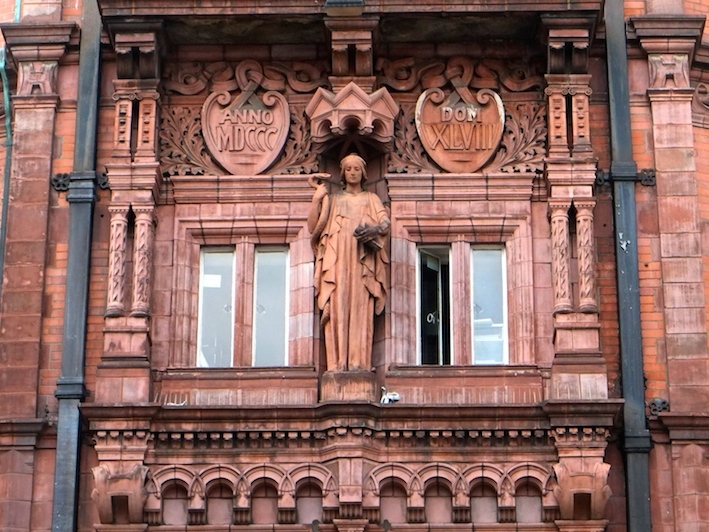 As often happens, I had a number of appreciative comments – both by email and in the comments section itself – on my previous post, and a couple of my readers mentioned the profuse decoration of this building, the former Prudential offices in Nottingham, designed by Alfred Waterhouse. It occurs to me that I perhaps rather under-did my account of this decoration, so, to compensate for this, here's another image, a close-up of part of the wall above the doorway, to show that Waterhouse, at least, could not be accused of under-egging the pudding. The centrepiece is the figure of Prudence, the Cardinal Virtue most appropriate for the Prudential company, elegantly robed and holding serpent and book. It's worth clicking on the image so that its details can be seen more clearly. I particularly like the way in which the sculptor has shown the tail-end of the snake, which appears between the folds of Prudence's garment. Around the figure a riot of decoration breaks out. From the arched and vaulted canopy above Prudence's head to the columns and pilasters on each side, there's plenty of architectural embellishment. There are also vigorous leaves, scrolling and intertwining bands, and the heart-shaped cartouches that contain the Roman numeral representing the date of the company's foundation. These letters, although they represent a Roman date, are not exaclty classical in their forms – the Cs in particular seem, in their varied but gentle curves, to look forward to the freedom of Art Nouveau. Altogether, this decoration is a glorious array, a tribute to the visual resourcefulness of the Victorians, and of Waterhouse in particular.